It’s summer in the city and The Moonlight Dolls are ready to travel! Prepare to be whisked away on the cheekiest tour of Europe to be found this side of the Atlantic, featuring exuberant and seductive neo-burlesque performances from Houston’s world-famous Moonlight Dolls. Audience costumes encouraged - jet-set glamour, l’amour! Mainly for small groups of 4 or less. For large groups of 6 or more. Packaged tickets (These tables can only be reserved by purchasing all seats in each section). Good views overlooking the whole theatre. Located in the Chaplin lounge. May become available to smaller groups a couple days before event. No food & beverage requirement unless large group. Seating is first come first serve, mostly standing room with cocktail service. FOR GROUP DISCOUNTS, CLICK HERE! You will recieve a response within 48-72 hours with a discount code to be used at checkout. Requests are answered in the order that they are received. Group discounts only available for select dates. Do not submit more than one request for the same party. Only valid for groups of 6 or more in VIP Mezzanine. We are unable to provide discounts once tickets are purchased. 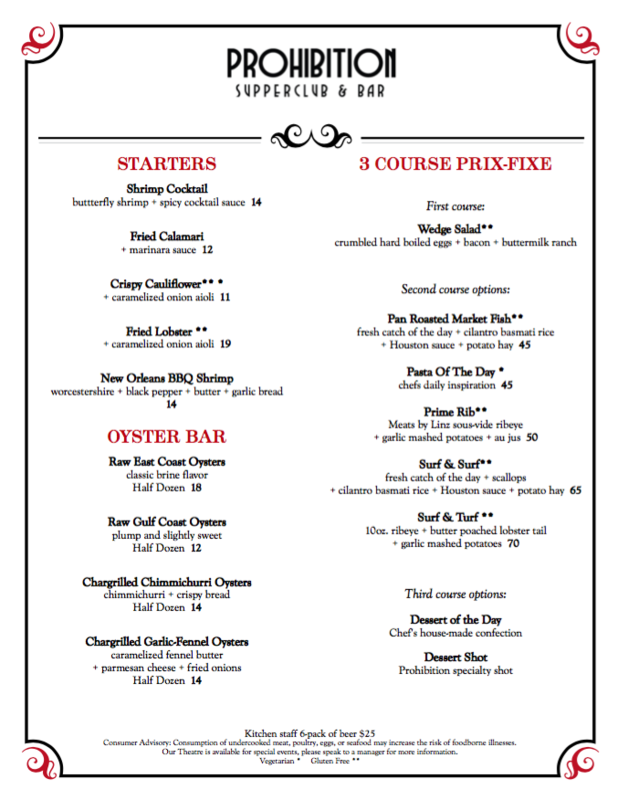 $45 prix-fixe dinner is required, payable at the end of the show. Drinks and gratuity are not included. Dinner reservations in the Prohibition restaurant do not apply towards your minimum in the theatre. By attending Provocateur your guests agree to the same waivers you do at the time of purchase. Please verify they have read and understand the rules and regulations above prior to the show. Valet park! We have a valet service at the corner of Prairie and Main from 6:00 PM to 2:00 AM.